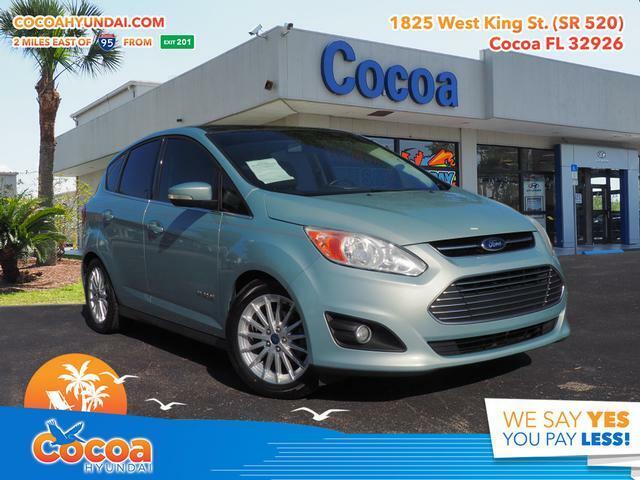 This 2013 Ford C-Max Hybrid SEL in Blue features: 4D Hatchback, 2.0L I4 Atkinson-Cycle Hybrid, FWD, Blue, 6 Speakers, Air Conditioning, Auto-dimming Rear-View mirror, Compass, Delay-off headlights, Front dual zone A/C, Fully automatic headlights, Panic alarm, Power driver seat, Power steering, Radio data system, Security system, Speed control, Spoiler, Turn signal indicator mirrors. CARFAX One-Owner. 42/37 City/Highway MPGAwards: * 2013 KBB.com Brand Image Awards Reviews: * If you are on the hunt for a highly-efficient vehicle, but unwilling to sacrifice horsepower and responsive handling, the 2013 Ford C-Max provides the best balance of fuel economy and driving fun in the segment. Source: KBB.comCocoa Hyundai - We say YES, you pay LESS!